We all know world history. It’s the course in high school we hate taking, because there is just so much information to memorize in such a short period of time and most of it is so BORING. Endless dates, a plethora of facts and events, the impact of humans and their actions on the world around them. History can really put you to sleep. However, it goes without saying that there are countless unsolved mysteries in the midst of all that real-life drama called history. It’s finding the interesting tidbits kept out of the history books that make reading historical fiction and historical disclosures so savory. That is exactly why Strange Stories, Amazing Facts is such a pleasure to peruse. Although Reader’s Digest designed the book to be more of an encyclopedia of informative topics than a storybook, the highlight of Strange Stories, Amazing Facts is its diverse content and the way it is grouped into individual “stories.” From modern cases of identity theft and forgery to grotesque murders and disappearances, the crimes of many centuries compose a serious journal of forgotten crime and punishment, an illustrative example of corrupted systems of justice around the world and (let’s face it) the criminals who never got caught...or were clever enough to escape. One of these was the case of “Jack the Ripper,” a brutal murderer in the late nineteenth century who was never caught and whose “methods” still drive chills through Londoners walking home late at night. Another dramatic area of Strange Stories, Amazing Facts is its analysis of the paranormal, mysterious ghosts who avenge murders and the invisible handiwork of restless spirits in ordinary houses. Is this a ghost story book as well, you ask? Yes, it is. And some of the best tales are hidden right in the middle. For the adventurous (and those still with a crush on Indiana Jones), there is a lot of discussion about hidden treasures that were never found and the explorers who attempted to recover them. Then there is the comedic, the hoaxes played by professional con-artists which tricked the world into self-doubt. A good example is the article about an uneducated man who took on several reliable professions under an assumed name and diploma, or the one-time forgery of one-dollar bills in the U.S. that took years to be detected. Last but not least, most of these “reports” are decidedly factual and include many historical figures and side episodes that history books (obviously) chose to ignore. Translation: you get a good story AND the historical facts in one bite, not to mention the tempting idea of trying to solve some of these “unsolved mysteries” yourself in the near future. All accounts relate events with commentary (like a fast-paced, condensed newspaper report) and are very fascinating with the book’s underlying mixture of irony and enigma in all the “tales” it exposes. 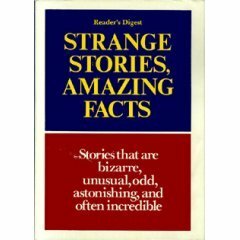 Whether read in chronological order or by random selection, Strange Stories, Amazing Facts holds a treasure trove of intriguing world history that is almost written like a fairy tale—enthralling, frightening, and incredible. And did I mention it makes great bedtime reading?